Undying devotion to your favorite TV show can lead to much worse than a sedentary life parked on the couch. For Stephanie Lucas, it threw her right in the middle of an intellectual-property lawsuit: In March she was hit with a cease-and-desist order from 20th Century Fox Television. Her actionable offense? She was selling a knitted hat inspired by a Fox TV show on Etsy. Lucas is a member of the Firefly fan community, a group dedicated to Joss Whedon’s short-lived “space western” series that originally aired on Fox. “I’m absolutely in love with this show and its characters,” Lucas says. And thus her shop features one special item dedicated to her fellow Browncoats (a nickname for the Independence fighters in Firefly, and now for the fans themselves). For as long as there will be television shows, books, movies, and music, there will be fans, hordes of them. Some shows may not receive a ton of commercial success, but will attract a cult following of people who are dedicated to their fictional universes. Conventions, such as this week’s Comic-Con in San Diego, stoke the passions of these mega fan communities, and enthusiasts show up wearing their favorite gear and memorabilia. Fans show off their homemade Nintendo costumes at DragonCon in 2012. But there’s a fine line when it comes to making memorabilia versus selling it, and that all comes down to copyright. Intellectual-property law is a tough nut to crack, and it can quickly stifle creative expression among well-meaning fans. In 2008, Steven Jan Vander Ark lost a lawsuit challenge from J.K. Rowling and Warner Brothers over an unofficial “Harry Potter Lexicon” he wrote to help fans keep track of the numerous characters, spells, and terminology Rowling used in the Harry Potter series. Four years later, CBS blocked a not-for-profit, fan-made production of a Star Trek film based off a new script. And between 2009 and 2013, Disney/Lucasfilm, Summit Entertainment (which owns the licensing for the Twilight film series), and video game developer Bethesda have all gone after fans for selling unlicensed homages to copyrighted TV shows, movies, books, and games. Some artists’ designs are considered a threat and give attorneys a headache, while others are considered benign or go completely unnoticed. The legal boundary is more of a blurry squiggle than a hard line, which poses quite the problem for fan artists. Stephanie Lucas was named in a large intellectual-property suit against fan crafters involving a simple, knitted, three-colored cap. 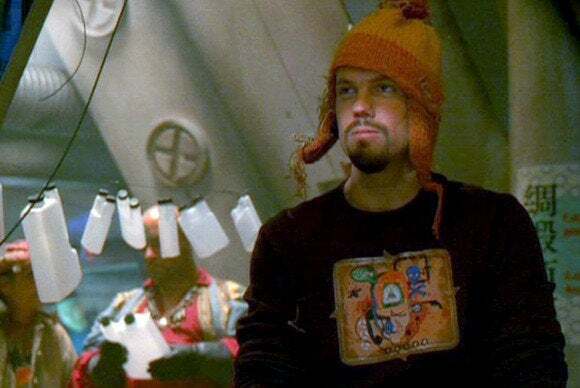 Jayne Cobb (played by Adam Baldwin) wore such a bright red, orange, and yellow hat in one episode of Fox’s short-lived sci-fi series. Cobb was a trigger-happy, rough-and-tumble character, but his not-so-intimidating chullo belied a softer side—his mother made it, so he wore it proudly. The hat quickly became a Firefly symbol, if you will, and it also was a fan-crafter’s dream: easy to make, but not readily available, as no official version was for sale. Firefly gained a huge fan following after it dropped off the air in 2002, but because it had seen little commercial success, fans had no official merchandise to scoop up. So devotees turned to the Internet—namely, to Etsy—and to fan conventions to share these handcrafted hats with like-minded souls. 'Firefly' fans can easily spot one another, thanks to these caps. Firefly continued to amass a huge underground following, and now—more than ten years after the show was cancelled—the series has gained enough traction to make Fox, the original producer, take notice. Earlier in 2013, Fox licensed retailer Ripple Junction to mass-produce, distribute, and sell the Jayne hat through online catalog ThinkGeek. In late March and early April 2013, shops on Etsy that sold the fan-made hats received cease-and-desist letters, after the deal between ThinkGeek and Fox’s licensed retailer was finalized. Another Etsy shop owner, Jessa, received a similar letter. “I got scared because I thought they might sue me,” she says. (We’ve omitted Jessa’s last name to protect her shop; she continues to sell the offending hats.) Both sellers took down their listings initially. They, like so many others, felt that they had no choice. At first, people pointed fingers at ThinkGeek, but representatives of the online catalog insist that the company played no part in the legal challenges. “ThinkGeek had nothing to do with the C&D notices… Would the C&D’s have happened if we did not carry the hat on our site? We’re not sure; we’ll leave that question to sharper legal minds than ours,” wrote ThinkGeek’s Carrie in an official statement. Droves of Firefly fans and crafters turned to the Web to express their disappointment and anger at Fox butting in, after remaining silent and uninterested in Firefly for years. “Why would Fox care about people making these hats for a show that’s been off the air for ten years? A show that they cancelled before the first season was over? A hat that appeared in one episode that didn’t even air?” says Lucas. The Etsy market is full of unofficial, handmade hats. Fox took action to protect the value of its license for official Jayne hats made by Ripple Junction. Although small, the Etsy sales cut into Fox’s sales of the official licensed hat, and Fox is within its legal rights to take action against the third-party sellers. Firefly fans are quick to point out that the hat’s story origins uniquely resonate with their own crafting motivations. Indeed, Cobb’s hat was a handmade gift from his mother, and it appears in only a single episode. “There has always been a touch of motherly love to each and every Jayne hat made by fans. No two are quite alike. That’s the charm,” writes Dan Roth in an article featured on Blastr. Fans who had been knitting these hats for years were now screwed, thanks to Fox’s claim that they broke the law after the official version debuted. But which law? “Merchandising rights is a monster that has grown without any proper legal backing,” says Madhavi Sunder, a professor of law currently at University of California, Berkeley, with a specialty in intellectual property and culture. “Under traditional copyright law, the exclusive right to make these goods is not there,” she says. The U.S. Supreme Court has made no rulings in regard to merchandising rights, so intellectual-property violations have to be considered on a case-by-case basis. Intellectual property is protected under both trademark and copyright, but the two concepts are different: Trademark protects names, terms, and symbols used to identify an original work or brand, and copyright protects the creative work itself. According to U.S. copyright law, the only groups with the right to distribute works based on an original creation are copyright holders. So, technically, only the original story creators are allowed to make pieces featuring images and concepts for which they hold the copyright. In the case of Firefly, that would be 20th Century Fox Television. But what about series director Joss Whedon and his original production house, Mutant Enemy Productions? It’s unclear what rights they have. However, a loophole in copyright law known as fair use allows some interpretation on copyrighted works. According to Rebecca Tushnet, professor of law at Georgetown University, fair use provides some leeway for fan art. Fair use allows the reproduction of protected works in cases of criticism, comment, teaching, scholarship, research, and other purposes. In a court of law, judges decide whether a piece is considered “transformative”—if it’s distinguishable from the original piece and adds artistic value or commentary. Another big problem with copyright infringement comes into play when something has the potential to be confused with official, licensed merchandise authorized by the intellectual-property owner, as stated in U.S. trademark regulations. In the case of the Jayne Cobb hat, It wasn’t necessarily the hat itself that posed the issue, but rather the fact that Lucas, Jessa, and so many other Firefly crafters called these hats “Jayne Cobb hats” using trademarked names and references to the show. But using names isn’t necessarily exclusive to trademark owners, either. “As long as artists are making it clear that [the item] isn’t from Fox, trademark law should not prohibit [the language used],” Sunder says. This type of speech is protected, as it is considered nominative use, according to Sunder. If the only way to identify something is to call it by its trademarked name, then the name is okay to use. The case of the hat is particularly interesting because of the item itself. According to Tushnet, clothing designs themselves cannot be copyrighted, only the pattern for the design. It’s possible that Fox now owns an official pattern to the Jayne hat, but Tushnet doesn’t think the design of the hat itself is protectable. In general, it is unlikely that a copyright holder will come after fan-art creators unless the fans are profiting from selling protected materials. Sunder believes that companies will leave fans alone if they can, because they don’t want to receive major backlash from the fan community. Still, fans can run into trouble even when they’re not trying to make a profit on their creations. 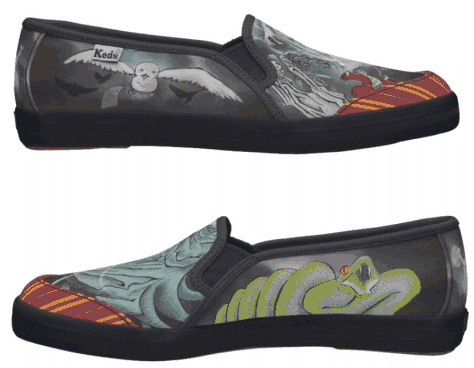 Graphic designer Sarah Buczek encountered legal difficulties when she tried to screen-print a scene from a Harry Potter tale onto a pair of Keds sneakers. She drew the image by hand, and uploaded her design to Zazzle under the name “Harry Potter Shoes.” Zazzle is different from Etsy—it’s an online marketplace for users to upload their original designs and create their own products, from shoes to mugs to iPhone cases. She had no intention of selling these shoes—she insisted that they were a gift for a friend, and placed an order for only one pair. Still, Zazzle refused to print them, claiming that the image was protected under copyright laws. Buczek’s shoes were inspired by Harry Potter, but are not a copy of an existing work. “I explained that they were my drawings—hand-drawn by me with Sharpie, scanned into Photoshop, and then repainted—but I was shot down,” Buczek told TechHive. “In this instance, your order contained products with copyright-protected content related to Harry Potter, which cannot be printed without written permission from the rights holder or licensor,” Zazzle stated in a letter to Buczek. 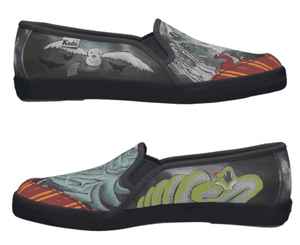 However, Buczek was eventually able to create the shoes through Zazzle after she dropped the Harry Potter reference and named them “Generic Battle Shoes” instead. Fans will always find a way to share their art with others. 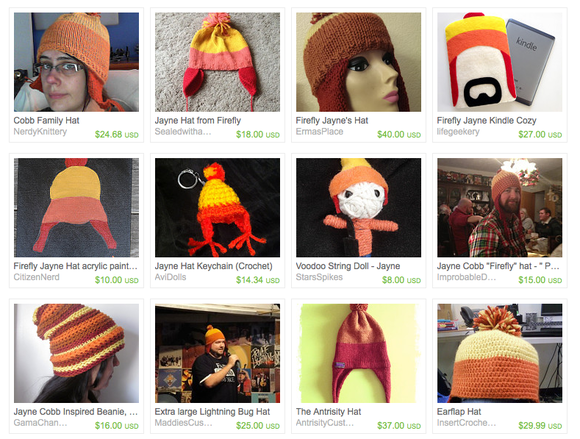 Three months have passed since the initial ban on unlicensed Jayne Cobb hats, yet you can still purchase them on Etsy. However, you probably won’t see them with the words “Jayne Cobb” or “Firefly” attached, and if you do, you’ll see large fan disclaimers stating that they have no affiliation with the show. “Since I was [originally] using Fox’s trademarked terms, I got in trouble for that. I learned that I ‘can’t show any endorsement’ for the show, so I resolved this issue by renaming the hat,” says Lucas. The problem with sticking to generic terms for items in your shop is that they aren’t easily searchable for other fans and Etsy patrons, but fans still make it happen: Etsy is full of shops that sell unique, original art inspired by pop culture. Jonathan Daily of Plagiarism Today provides a few tips for fans to follow when creating inspired art: Check the community rules, make it clearly unofficial, be noncommercial or charitable (if possible), be careful with domains, and comply with requests if the original creator asks for the item to be removed. “By no means do these steps prevent fan fiction and fan art from being a technical infringement, but they may help your use of the content be considered a tolerated and even respected use of the source material,” Daily writes.